well hello everyone, old faces and new ones. one of my besties, val photography, shot charlotte yesterday for her upcoming photo project. it was a very frosted shoot, and i thought you all might get a kick out of a few of the b roll candid shots! also, feel free to check out vals last project, the pink project, which i have posted about before on the board. you can check out that project at thepinkproject.com. flickr page because my damn website is down! Posted: Mon Oct 19, 2009 6:10 pm Post subject: ! whoa cool pics! char looks fabulous...(wrapping head around the big pink wig!). what is a 'very frosted shoot' mean? thanks for the behind the scenes pics, erin! ahh frosted wig! got it. cool. awesome pics. love the styling. Thanks! These are great. 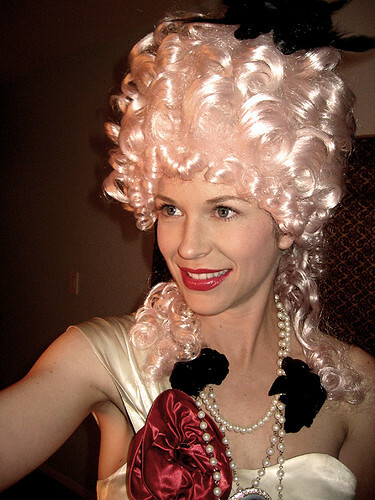 I doubt the real Marie Antoinette was as beautiful. a little more about the photographer, val patterson, and the photo project!